The consumer shift to mobile commerce is alive and well. More people are shopping on their phones than ever before. Smart retailers are destroying previous barriers to mobile conversion with intuitive, engaging experiences that make mobile shopping easier and fun. Today we’re going to look at the details of how one of these convenience drivers – mobile wallets – work and make mobile commerce more efficient for consumers and more lucrative for retailers. A mobile wallet is almost exactly what it sounds like: a “wallet” that is on your phone instead of in your pocket. They can store credit cards, loyalty memberships, reward cards, and more. How are Mobile Wallets Used? Most mobile wallets such as Apple Pay and Google Pay come standard on today’s smartphones, but there are some, such as PayPal, that require users to download the app. After installing a mobile wallet, users then take a picture of their card to load it into the wallet. The wallet will send the details to a TSP (token service provider) which will then return back a series of randomly generated numbers (this is the token) to the user’s wallet. This token will then be stored on the phone. This EMV token is what coordinates transactions with mobile wallets. When a shopper scans their fingerprint or presses “Complete Purchase,” the EMV token communicates with the merchant to transfer funds and complete the purchase. Interestingly enough, mobile wallets are more secure than physical cards. Mobile wallets use methods such as encryption and tokenization to mask credit card information, keeping merchants from even seeing this data. 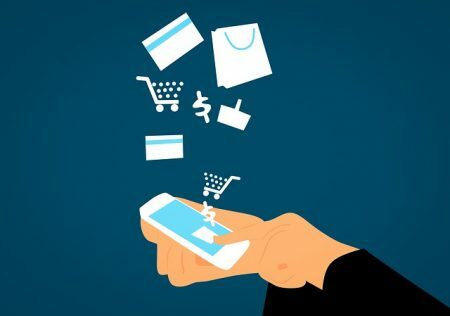 Should a merchant’s data become compromised, users who pay via mobile wallet won’t have any card info on file with the merchant, thus protecting them. Also, both Google Pay and Apple Pay also use biometric security methods, such as fingerprints and facial recognition, instead of PIN numbers and other vulnerable data. Both Apple Pay and Google Pay use a device-specific number and unique transaction code so that card numbers are never stored on devices or servers. When shoppers pay via Apple Pay or Google Pay, Apple or Google never share that card numbers with merchants. First, when a buyer clicks the PayPal button, it will take them to log into their PayPal account, or, if the buyer has previously enabled PayPal One Touch, they are then logged in automatically. Next, the buyer reviews and authorizes the payment. Finally, PayPal returns to the merchant’s page to finalize the payment. Just like Apple Pay and Google Pay, PayPal encrypts and withholds important bank and card information from the retailer, protecting shoppers from merchant vulnerabilities. Mobile payments are speeding up checkouts, enhancing security, and driving mobile commerce forward. Consumers now have alternatives to meticulously typing information into small mobile forms, and naturally, conversion is rising. However, mobile payments are not a cure-all for retailers looking to drive mobile success. These systems are merely a small part of a truly engaging and intuitive mobile experience, and at the end of the day, these experiences are what consumers crave.